This was the second summit in the international series Re-envisioning Exhibition Design, and was jointly organized by Fundación TyPA - Teoría y Práctica de las Artes, a long time leader in providing places of encounter, training and promotion in the fields of Literature, Museums, Film, and the Arts, together with UC Davis (USA), Central Saint Martins (UK) and The George Washington University (USA). In particular the summit underscored the emerging role of the exhibition designer as a critical mediator in exhibition teams where events and installations outside the museum are reshaping curatorial models of practice. 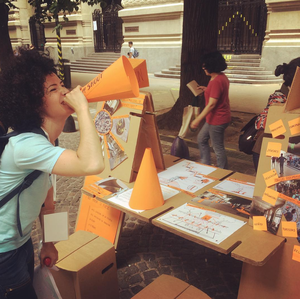 Here the designer emerges as a strategist providing creative direction for ‘front line, open source’ participatory public engagement in civic space. The city of Buenos Aires, as other cosmopolitan cities of Latin America, is renowned for its cultural resources, exceptional artists and lively citizenship, which respond to many regional challenges such as the aftermath of political unrest. The region is examining and confronting new design tools and formats to expand that creativity, in order to reshape museums as sites of social encounter and infiltrate civic spaces in dialogue with the communities they serve.